Leave it to crazy old lady Joan Rivers to say what we’re all thinking. Not that it should surprise us; she’s been doing it for years. 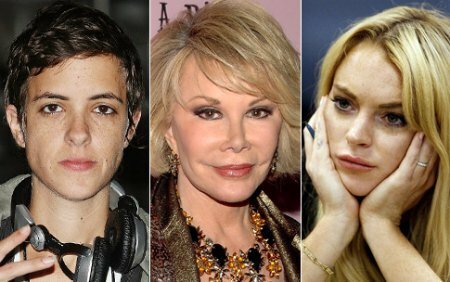 Joan River calls them like she sees them – basically calling Lindsay Lohan’s parents horrible parents. Then she offers to pay for rehab. But Joan doesn’t stop there; taking a shot at Samantha Ronson and other people around Lindsay who don’t seem to have, what Joan feels, is Lindsay’s best interest in mind. Joan Rivers is totally right – somebody should be taking care of Lindsay Lohan. And if it has to be Joan Rivers, so be it. Joan is so AWESOME!!! Her wit and off-the-cuff humor is unparalleled! Just saw her new documentary and it’s incredible.. she’s been accomplishing stuff for like 50 years that I had no idea about! She’s totally fascinating and stupid little Hollywood loser starlets like Lindsay Lohan could learn a lot from a show biz icon like Joan! 53 queries in 0.718 seconds.